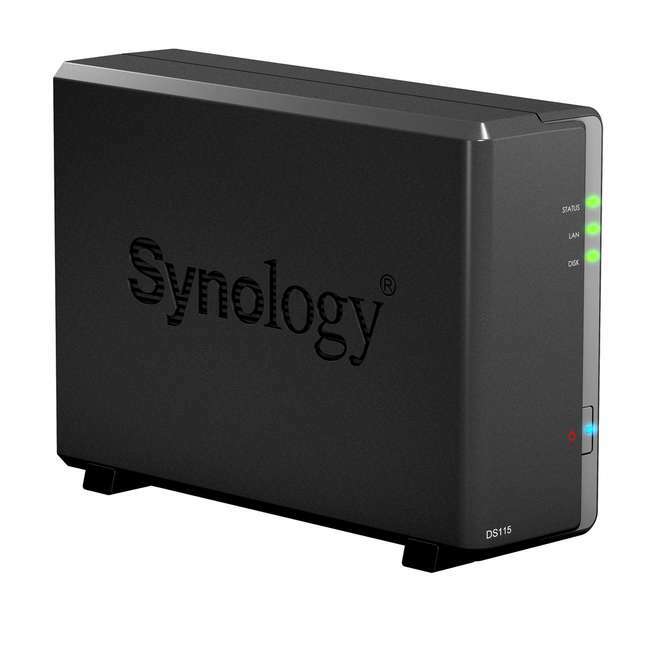 DS115 – black 1-bay device from Synology. Enough said? No? Read further. Synology DiskStation DS115 has a very compact and efficient design intended to be used in homes and small offices. This 1-bay NAS server can increase productivity by enhancing the ability to share, stream, and synchronize files with anyone and from anywhere in the world. While there may be a number of these server options for individuals and small businesses, this one has a number of features that make it worth taking a closer look at. Synology Americas DiskStation DS115 has a very compact design and offers a total of just 1 hard drive bay, which is why it is recommended only for individual home use as well as small offices. While this NAS server may not be designed for major corporations, it is still quite impressive for its size. There are three green notification lights on the front of the server, consisting of “Status”, “LAN”, and “Disk”, as well as the one on the bottom to indicate whether or not it is powered on. This NAS is black, differing in its exterior appearance from the DS215J, which was white in color. There are only two fixing screws in the back that hold the two pieces of the outer case in place, allowing for easy access to the single hard drive within. It is compatible with a number of different sized hard drives, all the way up to 6 terabytes. There are many different types of drives (Western Digital, Seagate, etc. ), that this NAS is compatible with, though the company does provide users with a list of recommended hard drive manufacturers. A maximum of 2,048 user accounts, 256 groups, 2 shared folder sync tasks, and 128 concurrent CIFS/AFP/FTP connections are allowed for this NAS. The dual-core MARVELL Armada processor that this NAS uses has vastly improved its ability to transfer data faster than ever before, with reading speeds that exceed 111.51 MB/s and writing speeds of over 104.69 MB/s. Data transfer speed is of course one of the more important things to consider when looking for a device such as this, and the DS115 definitely does not come up short in terms of its CPU. There are 512 MB of DDR3 RAM installed in the server and it is compatible with 3.5” and 2.5” SATA hard drives with an optional 2.5” disk holder. There is one USB 3.0 and another USB 2.0 port as well as an eSATA port on this NAS. The addition of a USB 3.0 port is definitely important because of how much of a difference it makes with regards to speeding up file transfers. This USB upgrade offers transfer speeds of up to 5 Gbps, which is nearly 10x as fast as USB 2.0, so you can transfer files from your computer to the external hard drive much faster while consuming a minimal amount of power. 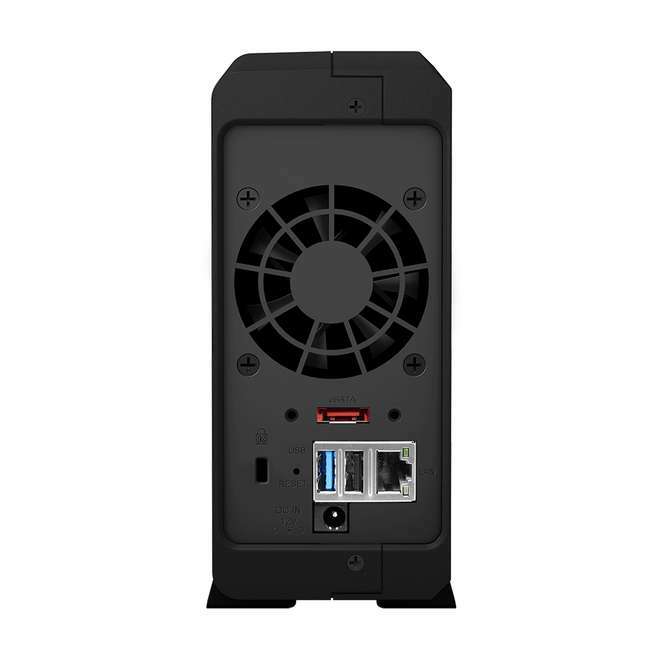 The 60mm x 60mm fan that is built into this NAS has cool mode, quiet mode, and low-power mode, allowing you to choose which ones you want to activate at any given time. This fan is fairly quiet even when it is not in quiet mode, which is definitely a plus. DS115 offers a lot of CPU-juice, what is quite a lot – considering it’s 1-bay NAS. This NAS has a number of useful features, including the built-in floating point unit, which enhances multimedia processing. Thumbnail processing with this server is fast so you won’t have to deal with slow load times, which is in and of itself a great thing. This particular feature also converts audio tracks to MP3 format on demand so as to reduce streaming bandwidth, which is yet another excellent and highly useful benefit. 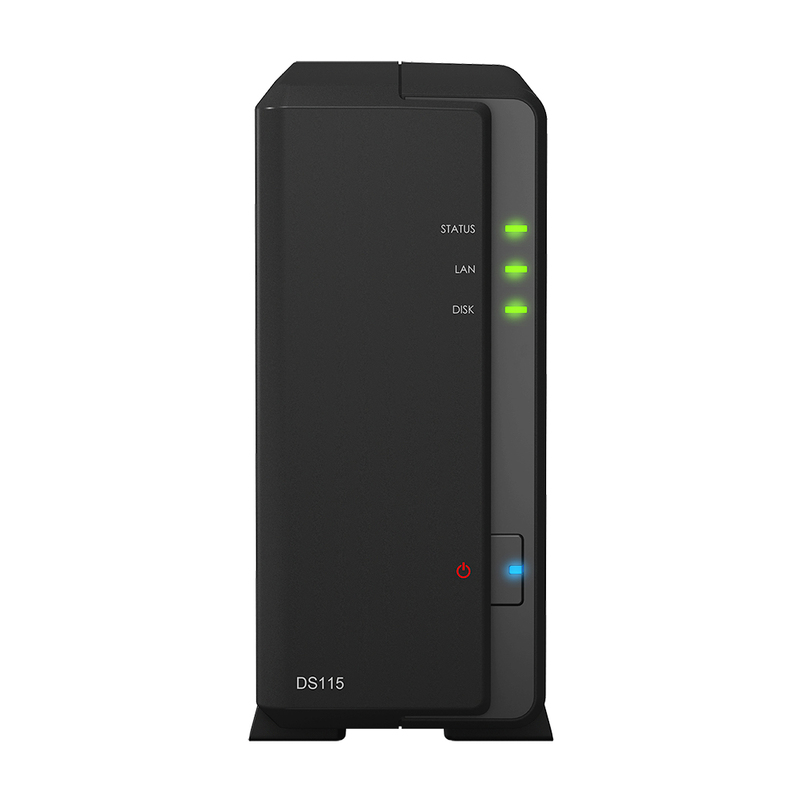 The DS115 supports and offers iTunes server, Glacier backup, HiDrive backup, Mail Server, Mail Station, Media Server, Cloud Sync, Download station, DNS server, directory server, Note Station, Photo Station, RADIUS server, and Surveillance Station. File sharing with this NAS is completely seamless across all different types of operating systems, including Mac, Linux, and Windows computers. The DS115 offers comprehensive network protocol support for FTP, AFP, SMB2, WebDAV, and NFS. The Windows AD and LDAP integration means that this NAS can fit into an existing network environment without any compatibility problems whatsoever, making less work for IT administrators. The recycle bin feature that this NAS comes with eliminates frustration over missing files, and it is supported on AFP, CIFS, File Station, and WebDAV. All of the files that are deleted in a shared folder get automatically sent to the Recycle Bin. If you tend to share large files over the internet, you will be happy to know that using FTP will not be a problem at all. You can host your own FTP server or choose to connect to another one to download files directly to DiskStation. There are a number of advanced settings to choose from, including bandwidth control and SSL/TLS. WebDAV: This feature allows you to quickly and easily edit and manage all files that are stored on DiskStation through a number of applications, including Windows Explorer, Mac OS Finder, or Linux File Browser. CardDAV: Allows you to keep all of your contact information in one centralized place on the DiskStation as well as various applications, including Mac OS, Apple iOS, Gmail, and many others. CalDAV: Allows you to host your own server for synchronizing calendars and tasks with the applications you want, including Mac OS, iCal, iPad, or iPhone. Note Station: This is a great feature which allows you to store everything from class notes to travel itineraries without having to use a third party app of any kind. You can make notes from anywhere, share them, or keep everything private and secure. If you are writing and storing information that is particular sensitive, you can use an encrypted password to protect it. Synology QuickConnect: Offers a comprehensive solution for accessing everything you need from anywhere and any browser or mobile device without the need to configure your router. You can do everything from browse photos to listening to a custom playlist within seconds. If you want to set up port-forwarding and do everything yourself, you can take advantage of the free DDNS services that Synology offers for this NAS. Choose your own hostname and connect from anywhere. You can log into the MyDS Center whenever you want to check your QuickConnect IDs, DDNS host names, and IP addresses in the same portal. All it takes is just one click to gain access to any of your servers. If you ever have a problem that requires assistance, Synology offers excellent technical support. One of the primary reasons to purchase a NAS is for data backup, which is something that the Synology DS115 may not be extraordinarily great for. If you have no desire to mirror your drive with another for backup purposes, a single-bay NAS like this one is perfectly adequate. This server can however be a good way to backup data that you already have on a laptop or desktop computer, though the single bay does not allow for mirroring, which is definitely something that will turn off a lot of consumers. Synology’s DiskStation Manager (DSM), which this NAS uses, is a browser-based operating system that makes managing this device and all of the data on it quite easy and simple. The software’s intuitive and user-friendly interface is definitely a good thing, especially for those who have never used one of these devices before. The DiskStation Manager makes it easy for you to access and share all of your data across a network, so there are no complications or issues whatsoever. The Package Center allows you to download and install a number of useful add-on packages that are specifically designed for either individual or business purposes, enabling you to enjoy movies or other media as well as increase productivity at work. DiskStation is a DLNA Certified Digital Media Server, and it is an excellent way to stream all types of multimedia to a number of devices, including TVs and media players. TV streaming is very easy with this NAS, allowing you to integrate your server with your television for an interconnected home media environment. Those who have Chromecast will find that Synology’s mobile app DS audio and DS video can be used on Android and iOS devices in a very easy and straightforward way. Video Station is a great piece of software that comes with NAS, providing you with access to all of the tools you need to browse through and organize your movies, TV shows, home videos, and anything else you have stored on DiskStation. This software will allow you to search for specific movies or other video files easily by the director’s name, release year, and other criteria. Nothing special in the back with Synology DS115. But hey, it works! Design: Both of these NASs offer only 1 bay for hard drive storage as well as a maximum capacity of 6 terabytes. With regards to the exterior appearance of these products, the TS-131 is white, whereas the DS115 is black in color. Where the DS115 has three notification lights on its front, the QNAP has four, labeled respectively as “Status”, “LAN”, “USB”, and “HDD”. Hardware: These NASs both come with 512 MB of memory, but there is a slight difference when it comes to the CPUs in these products. While both of these storage devices use a dual core processor, the QNAP TS-131 uses a Freescale ARM Cortex A9, which is ultimately on the same level as the DS115’s MARVELL Armada in terms of power and speed. Where the DS115 only offers one USB 3.0 port, the TS-131 has three. Software: The TS-131 offers a very user-friendly and intuitive QTS interface with an intelligent desktop that allows users to monitor important system information real-time as well as open numerous application windows to run multiple tasks concurrently. Both of these NAS products have great software to compliment their hardware with not a ton of difference between them in this regard. Features: When it comes to cloud storage solutions, the TS-131 has a lot to offer. This NAS comes with Qfile, which allows you to access, download, upload, manage, and share all of your stored files quickly and easily. Qmanager lets you monitor and manage the NAS itself remotely without having to even turn on your PC. There is also Qmusic, which allows you to stream or download music from the server to any of your mobile devices. The DS115 has many similar features that allow users to do the same exact things. Although it is true that there are some slight differences between the Synology DS115 and the QNAP TS-131, such as a couple extra USB 3.0 ports and a different color, most of them are small and unremarkable. The QNAP NAS is the more expensive option and has generally less favorable online reviews, making it the underdog in this particular comparison. If you are looking for an NAS that can meet all of your needs, you will definitely want to take a look a close look at some of the differences between the Synology DiskStation DS115 and the NSA310 before making up your mind as to which one you want to buy. Design: The NSA310 has the same sleek black design as the DS115 with 5 notification lights instead of just 3, which is a small and fairly insignificant difference overall. The NSA310 has only two USB 2.0 ports and does not offer USB 3.0 at all, making it inferior to the DS115, at least in this regard. One of the most noteworthy differences between these two products is that while the DS115 has a maximum storage capacity of 6 terabytes, the NSA310’s max capacity is only 3 terabytes. Hardware: When it comes to the hardware of these two NASs, the NSA310 uses a 1.2GHz Marvell Kirkwood CPU, which is very similar to the DS115’s Marvell Armada, though ZyXEL’s is not a dual-core. The DS115 comes with a total of 512 MB of DDR3 RAM, where as the NSA310 only has 256 MB. In terms of sheer hardware, Synology’s NAS is definitely the superior choice. Software: The NSA310 offers some great software that is very easy to use, even for those who are not terribly familiar with how these types of devices work. ZyXEL’s zPilot comes with an automatic file classification feature that makes it extremely easy to store and manage of your media files. All you have to do is simply drag the files onto the zPilot icon on your desktop and they will immediately be identified and organized. Managing, editing, uploading, and downloading files with the ZyXEL NSA310 is definitely meant to be as easy as possible for users, which makes it very similar to the DS115 in that sense. Features: The NSA310’s RSS feeds allow users to set up automatic downloads of internet content, such as audio and video podcasts, so their media files will be readily accessible online. All FTP, P2P, and HTTP downloads can be sent directly to this NAS. The encrypted Remote Replication feature enhances the user’s ability to protect sensitive and valuable information, which is also seen with the DS115. When it comes to features, these two NSAs are quite similar with little to no noteworthy differences. The ZyXEL NSA310 and the DS115 are similar in many respects, but the DS115 has much more to offer in the way of hardware, specifically the amount of memory it comes with as well as its maximum storage capacity, which is larger by 3 terabytes. And while the NSA310 is a bit less expensive than the DS115, you simply don’t get as much for your money. Both of these servers/storage devices are highly useful for small office and home use, specifically multimedia/home entertainment setups, but Synology’s NAS is clearly superior with regards to its overall hardware specs. If you are willing to spend a little bit more, the DS115 is clearly the better option between these two products. The DS215J is the 2-bay version of this NAS and it is a great investment for those who put a lot of emphasis on data security. The extra bay will provide you with more storage as well as a way to mirror your hard drive so you won’t have to worry about losing all of your data if one drive fails for whatever reason. Although the DS215J is identical to the DS115 in every way except the extra bay, it is definitely worth considering if mirroring is very important to you. The Synology America DiskStation 1-bay NAS is a great overall option for individuals who need a way to quickly and easily access and stream a variety of multimedia files, as well as those who work in a small office and want to increase productivity as much as possible. While this NAS only offers 1 hard drive bay, it is definitely adequate for those who do not place a lot of emphasis on data security. If you are concerned with data security, however, the DS215J is the much better option, as it offers the extra bay for mirroring.